Wheelchair extreme sports are an awesome way for paraplegics to stay active and have fun, but like any extreme sport there is an element of danger involved. Since many people in wheelchairs experience partial or total loss of feeling in their lower extremities, it is sometimes difficult for them to tell when they’ve sustained an injury. An untreated injury could lead to serious complications down the line. 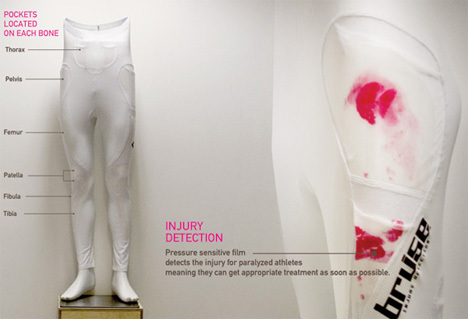 The Bruise suit, created by Dan Garrett, Elena Dieckmann, Ming Kong & Lucy Jung, is a smart way to ensure that wheelchair athletes don’t suffer injuries that go unnoticed. Bruise is a pair of high-waisted pants that use technology to show just where an injury occurred and how severe it may be. The stretchy, breathable material allows athletes the freedom of movement needed to play extreme sports. But if they should happen to fall or sustain a hard hit, the Bruise will indicate if an injury occurred and how serious it might be. 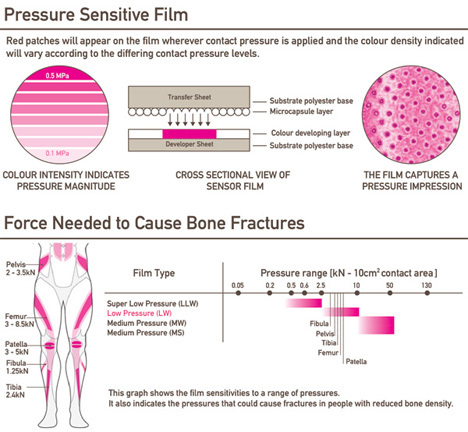 The suit does this with several pieces of pressure-sensitive film located in the areas of the body most likely to sustain injuries. If an area is stressed due to impact, that spot changes color to indicate a possible injury. The color is deeper for more serious impacts, so an athlete can know if they need immediate medical attention or if they can keep playing and just get bandaged up later. The pressure-sensitive film pieces are replaceable and recyclable, so a fresh set can be inserted before the next game.